Are you passionate about food and photography? Are you inspired to focus the lens of your food photography in an exciting, creative way? Do you dream of connecting with and learning from vibrant, amazing food media experts? Epicurean Creative invites seasoned professional photographers, enthusiastic novice photographers and food bloggers alike to enhance your qualifications in food media, discover how to rise to the top in a competitive landscape, and effectively promote yourself at their Food to Frame Media Retreat in Seattle, Washington, August 10-16, 2016. Learn more and register here. Epicurean Creative, Andrew Scrivani, Soo-Jeong Kang and Kate McDermott invite you to join them at an intimate, hands-on food media retreat. Enhance your qualifications in food media, discover how to rise to the top in a competitive landscape, explore the relationship between still and motion photography and discover how to effectively promote yourself. 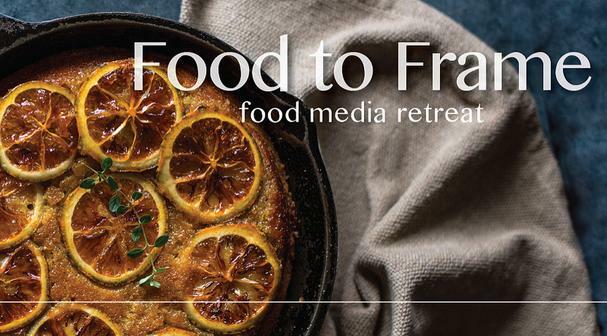 Build your food media portfolio during this invaluable shooting and learning experience. Epicurean Creative creates spaces that celebrate the art & craft of food. From insightful narratives of sustainable, artisan and small batch food-related producers to tours, retreats and workshops focused on the food arts, our aim is to create a community of like-minded people to share their stories and talents, hone their craft and inspire authentic connections. We deliver inspirational experiences that educate, encourage and support creative activities in the food arts. Andrew Scrivani is a commercial photographer and director with extensive experience in all three arenas of food and lifestyle photography and videography: editorial, publishing and advertising. He is also an internationally recognized workshop instructor and columnist on the subject of food visuals. His clients include: The New York Times, Conde Nast, Meredith Corporation, Hearst Corporation, Disney, Hay House Publishing, Clarkson Potter, Norton and Grey Advertising. Kate McDermott is the creator and founder of Art of the Pie®. Lauded by the likes of Ruth Reichel, Dorie Greenspan and Elise Bauer, she is widely acknowledged as one of the best pie makers ever, and has taught the time-honored craft to thousands. She has been featured in The New York Times, Washington Post, USA Today and countless other publications. In 2008 her pie was featured in Saveur Magazine’s: The Saveur 100 issue and appeared on the cover. Kate’s first book, Art of the Pie®, will be published fall 2016.